April 27th - May 25th (28 nights) Euro 559,00; April 27th - June 1st (35 nights) Euro 699,00; August 31st - October 7th (37 Nights) Euro 819,00; September 7th - October 7th (30 Nights) Euro 509,00. Price valid only by booking for the whole period. Periods available: A.	April 27th - Maggio 25th (28 Nights); B.	April 27th - June 1st (35 Nights); C.	August 31st - October 7th (37 Nights); D.	September 7th - October 7th(30 Nights). 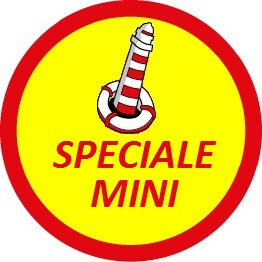 Total price for 1 SPIAGGIA Pitch + 2 Persons. The daily person rate will be charged for any additional person according our price-list. Tourist Tax NOT in price included. 30% Deposit required by booking (FREE Booking fees). April 27th - May 25th (28 nights) Euro 509,00; April 27th - June 1st (35 nights) Euro 639,00; August 31st - October 7th (37 Nights) Euro 749,00; September 7th - October 7th (30 Nights) Euro 459,00. Price valid only by booking for the whole period. Periods available: A.	April 27th - Maggio 25th (28 Nights); B.	April 27th - June 1st (35 Nights); C.	August 31st - October 7th (37 Nights); D.	September 7th - October 7th (30 Nights). 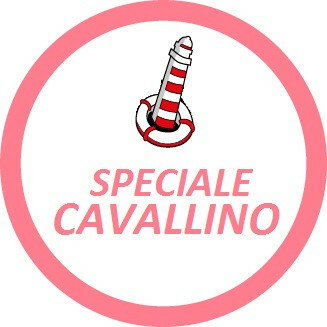 Total price for 1 CAVALLINO Pitch + 2 Persons. The daily person rate will be charged for any additional person according our price-list. Tourist Tax NOT in price included. 30% Deposit required by booking (FREE Booking fees). April 27th - May 25th (28 nights) Euro 479,00; April 27th - June 1st (35 nights) Euro 609,00; August 31st - October 7th (37 Nights) Euro 708,00; September 7th - October 7th (30 Nights) Euro 429,00. Price valid only by booking for the whole period. Periods available: A.	April 27th - Maggio 25th (28 Nights); B.	April 27th - June 1st (35 Nights); C.	August 31st - October 7th (37 Nights); D.	September 7th - October 7th (30 Nights). Total price for 1 MINI Pitch + 2 Persons. The daily person rate will be charged for any additional person according our price-list. Tourist Tax NOT in price included. 30% Deposit required by booking (FREE Booking fees). 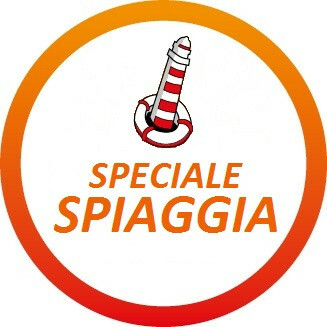 April 27th - August 3rd (98 Nights): 1 CAVALLINO Pitch + 4 Persons - Euro 2.800,00. Price valid only by booking for the whole period. Periods available: A.	April 27th - August 3rd (98 Nights). Total price for 1 CAVALLINO Pitch + 4 nominal Persons Tourist tax NOT in price included: Lump sum € 20,00 per nominal person. The daily person rate will be charged for any additional person according our price-list. Tourist tax NOT in price included: € 0,50 per person. 30% Deposit required by booking + € 20,00 for Booking fees. Standard Equipment: 220V/1300W electric hook-up point 6.3A; Drinking Water Hook-Up Point; Drain Water; Sat-Tv hook-up point; Wi-Fi (paid connection); Parking for one car or motorbike by the Pitch. The rate includes: Pitch Rate; Persons Rate (4 nominal people); Toilet blocks with basins, shower facilities and Hairdryers; Beach access (Sun Umbrellas and Loungers not included); Common Refrigerator for Cooling Elements; Swimming-Pool for children with Fontaine, Slider and Loungers; Solarium Terrace with Jacuzzi and Loungers; Activities for children; Taxes (Tourist Tax not included); Electricity; hot and cold water; Chimical Toilet. NOT in the price included: Wi-Fi; 110 Lt. Refirgerators rental; Beach Service (1 Sun Umbrella + 2 Beach Loungers); Tourist Tax (per Person per Night); all services not mentioned above. Provided on request and NOT INCLUDED: Wi-Fi; 110 Lt. Refirgerators rental; Beach Service (1 Sun Umbrella + 2 Beach Loungers); Pedal Boat and Floating Platforms Rental; S.U.P. [Stand Up Paddle Boards] Rental; Bycicles Rental; Electric Bicycle Rental; Launderette (coin); Dryer (coin); Bus Tickets; Bus and Motorboat Tickets to Venice and the Lagoon Islands; Printer service; Fax service. April 27th - September 28th (156 Nights): 4 Persons - Euro 3.950,00. Price valid only by booking for the whole period. Periods available: A.	April 27th - September 28th (156 Nights). 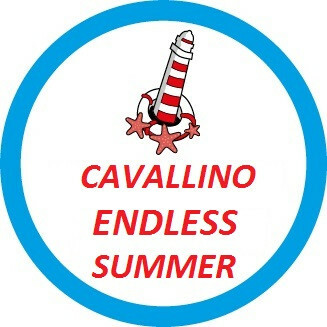 Total price for 1 CAVALLINO Pitch + 4 nominal Persons. Tourist tax NOT in price included: Lump sum € 20,00 per nominal person. The daily person rate will be charged for any additional person according our price-list. Tourist tax NOT in price included: € 0,50 per person. 30% Deposit required by booking + € 20,00 for Booking fees. Standard Equipment: 220V/1300W electric hook-up point 6.3A; Drinking Water Hook-Up Point; Drain Water; Sat-Tv hook-up point; Wi-Fi (paid connection); Parking for one car or motorbike by the Pitch. The rate includes: Pitch Rate; Persons Rate (4 nominal people); Toilet blocks with basins, shower facilities and Hairdryers; Beach access (Sun Umbrellas and Loungers not included); Common Refrigerator for Cooling Elements; Swimming-Pool for children with Fontaine, Slider and Loungers; Solarium Terrace with Jacuzzi and Loungers; Activities for children; Taxes (Tourist Tax not included); Electricity; hot and cold water; Chimical Toilet. NOT in the price included: Wi-Fi; 110 Lt. Refirgerators rental; Beach Service (1 Sun Umbrella + 2 Beach Loungers); Tourist Tax (per Person per Night); all services not mentioned above. Provided on request and NOT INCLUDED: Wi-Fi; 110 Lt. Refirgerators rental; Beach Service (1 Sun Umbrella + 2 Beach Loungers); Pedal Boat and Floating Platforms Rental; S.U.P. [Stand Up Paddle Boards] Rental; Bycicles Rental; Electric Bicycle Rental; Launderette (coin); Dryer (coin); Bus Tickets; Bus and Motorboat Tickets to Venice and the Lagoon Islands; Printer service; Fax service.